It's a deadly pattern that is best used through the months of May and June, depending upon the temperature and the main hatch. 1. Fix hook in the vice and run the thread down to the bend. Catch in a small tuft of brown marabou plus a length of clear Nymph Glass. 2. Take a pinch of cream marabou plus two or three strands of marabou. Place them together and catch in by their tips. Secure with tying thread. 3. Wind the thread to the point where the hook shank curves down. 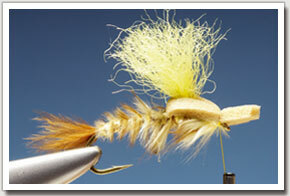 Gently twist the marabou then wind it along the shank in close turns. 4. Secure the loose ends of the marabou with tying thread then wind the clear Nymph Glass over the body in evenly-spaced turns. 5. Secure the loose end of the Nymph Glass with thread and remove the excess. Next, catch in a short length of yellow Poly Yarn. 6. Secure Poly Yarn, winding turns of thread around the base to form a wing post. Cut a thin strip of foam down the middle and secure at the wing. 7. Take another pinch of cream and brown marabou. Catch it in at the same point as the foam, then wind up to the eye to form the thorax. 8. Draw the foam forward so one thin strip sits either side of the wing. Secure at the eye and cast off with a whip-finish. Trim foam to length.